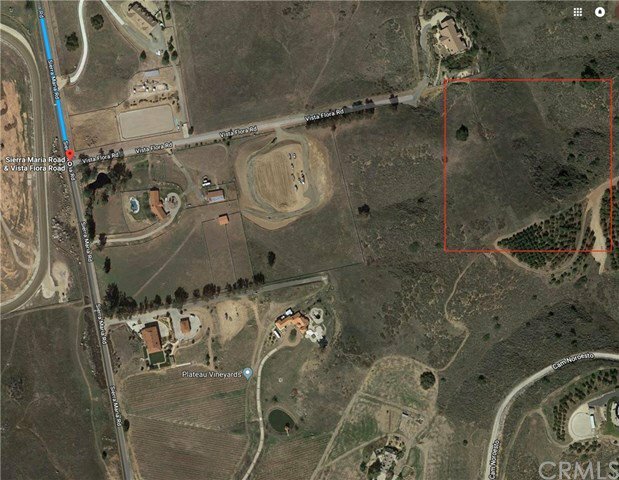 This gorgeous lot is located in the hills of Santa Rosa plateau within a gated residential community of La Cresta. Exit Clinton Keith Road exit 68 off the 15 freeway. Turn right onto Avenida La Cresta. Turn left onto Valle Vista. Turn right onto Sierra Maria Road. Turn left on Vista Flora Road. The parcel is located at the end of the road towards the right corner. Approximate address is 20XXX on Vista Flora Road. This corner lot features 9.04 acres of residential development potential offering 360 panoramic views of the rolling hills, city lights and mountains. A unique offering surrounded by multi million dollar homes, ranches, vineyards, rolling hills and villas. Its location within ecological reserves from the city insures that this land maintains its wonderful views and privacy. Utilities are nearby on the streets and this property is ready for its new owner to start building their dream estate!